• The Oregon Measure of Economic Activity slipped to -0.19 in June from a revised 0.39 the previous month. The three-month moving average, which smooths month-to-month volatility in the measure, stands at 0.12 where “zero” for this measure indicates the average growth rate over the 1990-present period. • The manufacturing sector continues to provide a positive contribution to the measure, while the household sector had a neutral impact. Somewhat softer residential permit and employment numbers restrained the construction sector this month. • The University of Oregon Index of Economic Indicators™ rose 0.5 percent in June; the UO Index has been rising or flat in each of the last nine consecutive months. • Initial unemployment claims were essentially unchanged at a level consistent with ongoing job growth while employment services payrolls, largely temporary employees, rose. • Residential building permits (smoothed) were largely unchanged. Core manufacturing (nondefense, nonaircraft capital goods) orders and manufacturing hours worked both gained during the month, as did consumer sentiment. The interest rate spread widened sharply as expectations of a change in monetary policy took hold. 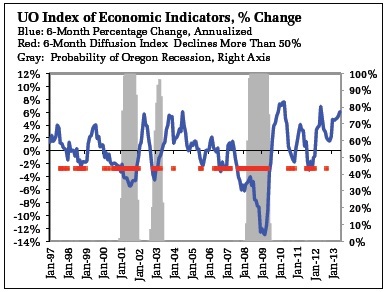 • Together, the two indicators point to sustained expansion in Oregon at an average pace of activity. National growth was slow in the first half of this year, but is expected to accelerate in the second half of the year and into 2014 as the impact of fiscal contraction wanes. This should have a positive impact on the Oregon economy as well. With a decade of challenging economic conditions behind us, what are the prospects for normalizing the economy? Brad DeLong, Professor of Economics at UC Berkeley will paint a picture of the US economy as it might look if it rebounds to what we would consider more normal conditions. In addition, Jim Mullinax, Political and Economic Section Chief at the U.S. Consulate General in Shanghai will review the changing Chinese economy and what it means for Oregon firms looking to do business overseas. Our attention will also be closer to home, as Josh Lenher of the Oregon State Office of Economic Analysis looks at how the composition of the Oregon labor market has changed relative to the US and what it might mean for the Oregon economy moving forward. In addition, we will include presentations by University of Oregon economists, Forum Director Tim Duy and Professor Jeremy Piger, that further increase our understanding of the Oregon economy and what’s in store for 2014. We hope you can attend and help us celebrate our 10th anniversary. Please visit econforum.uoregon.edu to register. Be sure to register early – we have sold out the last three years! 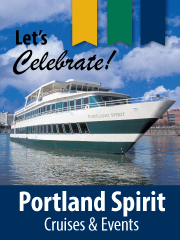 Special thanks to our Presenting Sponsor KeyBank, our silver sponsor the Portland Business Journal, and our bronze sponsors the Port of Portland, Colliers International and the Portland Business Alliance.